Red love heart custom Wedding Badges. Name of the guest & their relationship with you or role at the Wedding. So are they the Flower Girl, Bride to Be or friend of the Bride? 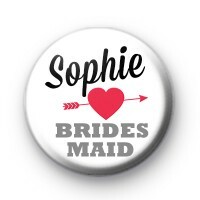 Let us know what name you would like on the badge & also what relationship or role they have at the wedding and we will customise the badges for you.